Today, the U.S. Supreme Court affirmed the validity of our non-discrimination laws, including the need to protect LGBTQ people from discrimination. While in Masterpiece Cakeshop v. Colorado, the court reversed the Colorado Civil Rights Commission ruling, it did so on grounds specific to this case, and did not find a constitutional right to discriminate. But we know we have not seen the last from opponents of equality trying to chip away at hard-earned protections. And this ruling does not address the discrimination that millions of Americans in states without explicit LGBTQ protections still face. 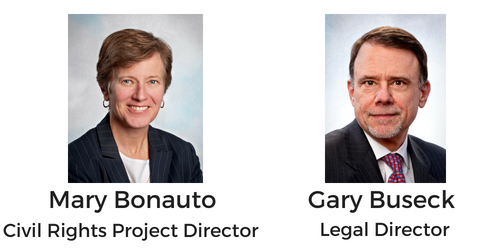 Join our call with GLAD’s Legal Director Gary Buseck and Civil Rights Project Director Mary Bonauto to hear the important details of the Masterpiece decision and find out what this may mean for the future of LGBTQ rights.